tasty treats from my kitchen to yours...enjoy! Grilling is one of my favorite ways to cook. It's quick, healthy, and the best part is minimal clean up! It's especially perfect for summertime because honestly, who wants to heat their house up even more with the oven? Not me! Last year, Musselmans was kind enough to send me a jar of Apple Butter. I was sort of an Apple Butter virgin at that time but my recipe Spiced Shredded Apple Butter Brisket Sliders turned out so well, I have been using it all the time! In addition to being delicious and versatile, it is gluten free and dairy free. Musselmans just sent me another jar, a set of recipe cards and a Wilton Armetale Grillware Fish Griller! This is perfect because I make fish quite often and it can be used in the oven, stove or grill. Using these items, I wanted to share a simple recipe with you guys that has basically no prep and no clean up. I do this during the week after work a lot because it's so easy and extremely healthy. I used salmon but you could easily do this with another type of fish, chicken or steak. I served the salmon over arugula but the vinaigrette is good with any type of lettuce or green. Happy New Year! Hope your holiday season was as amazing as mine! This year I spent the holidays with my family in Arizona. Quite different from the east coast cold and snow I'm used to but I am definitely not complaining! Now that the holidays are over and it's back to healthier eating choices, I needed to create something new and exciting instead of the same old boring grilled chicken and veggies. One of my favorite appetizers is Baked Feta. I thought about making it but then that would force me to sop it up with crusty bread, which I'm trying to avoid! I figured I would try it over chicken and it was a success! This would be great served over pasta but it pairs nicely with roasted vegetables as well. 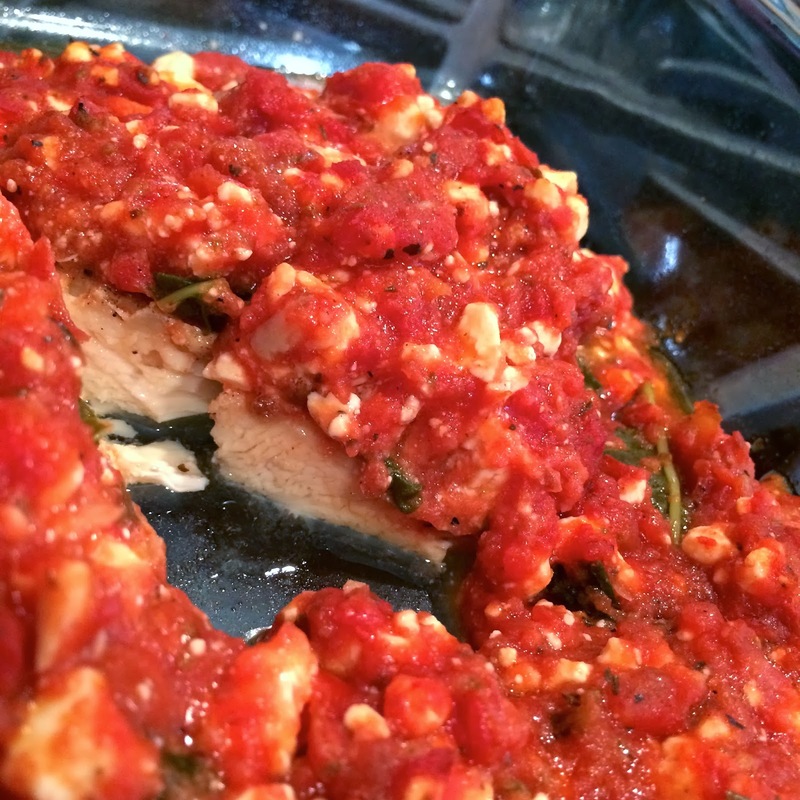 In the original Baked Feta recipe, I used a jarred organic pizza sauce. For this recipe I made a homemade marinara sauce. I've included the recipe for my marinara below but either way is fine. You could certainly make this spicy if you prefer by adding some crushed red pepper flakes. Well hello there old friends! I can't believe it's been so long since I've blogged! I guess a break-up, a cross country move (to a much nicer climate, might I add! ), a new job, the passing of my dear grandfather and many other life events take precedence. Despite all of this, I am finally back! Although I have not been blogging, I HAVE been cooking and I have so many great things to share with you guys! Please let me know if you have any suggestions as well. Since I could not decide what recipe to share first, I figured I would just write about what I concocted today. I know it's the easy way out. So what. I wanted to make something light that would provide me with leftovers for lunch tomorrow. I decided on a Sesame Chicken Stir-Fry. 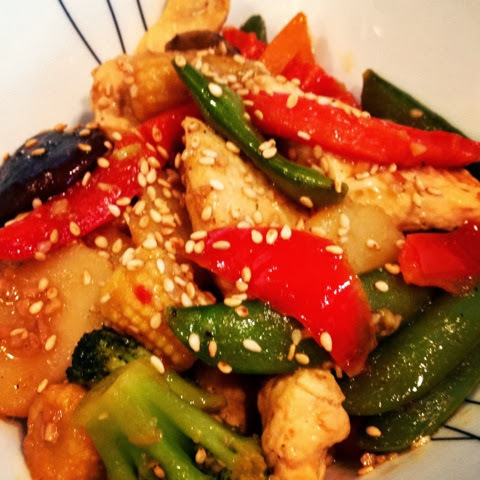 I ended up using up a bag of frozen stir fry vegetables but fresh veggies are even better. It was light but had a ton of flavor and would be great over rice as well. I opted to eat it without. Next time I make this, I may attempt to do so in the Crock-Pot! -Sprinkle sesame seeds over and serve! Both of my parents are turning 60 this year! I originally wanted to have a surprise party for them at my house but life happens and plans changed. Since I am relocating across the country in two weeks, I unfortunately won't be here for their actual birthdays, so decided to cook them dinner and have a little early celebration at their house. One of my mom's favorite dishes is Penne Mediterranean from Bravo restaurant. This pasta dish includes spinach, feta, sun dried tomatoes and pine nuts, amongst other delicious ingredients. I decided to re-create it at home and it turned out amazing! The recipe I found online was enough to feed an army, so I adjusted it so it was enough for one family! Happy 60th to the most supportive, loving parents a girl could ask for! Love you both! I love making fish for dinner. It's healthy, easy to prepare, and doesn't take long to bake at all. Pretty much any fish will work with this recipe. I prefer cod, which is pretty versatile. It has a mild flavor, good texture, and is available year round. No matter which fish you choose, it's important to select wild caught as opposed to farm raised. As I mentioned in my Spicy Baked Cod recipe, wild caught fish is more natural and of higher nutritional value vs it's farm raised counterpart. This particular recipe has tons of flavor! I've made this on several occasions and it's always a big hit. It's hard to believe it's so easy to make. I served it over brown rice but if you're watching your carb intake, its also good with a salad or green beans. Apparently it's CrockPot month over here! Due to the 3° weather we are currently experiencing (literally), I wanted to make chili. I couldn't find a recipe that was both healthy AND tasty...until now! This 3 bean chili uses ground turkey breast and couldn't be any easier to make. The only thing I added was a little bit of fresh garlic when I was browning the turkey. I topped mine with a dollop of plain, non-fat greek yogurt (in place of sour cream), cheddar cheese, onion, and fresh cilantro. I have to say, the toppings made the dish for me. So use all or whatever combination you like, but don't skimp! Ok, so you all tried my last post, right? The secret ingredient was apple butter. Since then, I've been in the mood for all things apples. I pinned this recipe awhile back on Pinterest and finally tried it. When I checked out the recipe page, I was pleasantly surprised to see the blogger was from my hometown of Pittsburgh. I was even more pleasantly surprised once I tasted these! They taste like mini apple pies, without all the guilt! To make it healthier, I used apple butter instead of regular butter. I doubled the filling part of the original recipe and added extra walnuts because the filling is obviously the best part! The recipe below is my adaptation of the original. The first time I made them in the CrockPot and they turned out great. I decided to make them on a whim another night and didn't have 3 hours to let them slow cook, so I baked them in the oven which only takes about 45 minutes. I prefer the oven method. You will know when they are done when you can easily slide a toothpick into one of the apples. These are also good topped with vanilla frozen yogurt or ice cream. You can refrigerate these for up to 3 days, just store them in an air-tight container. Coming from an Italian/Irish background (hence the name half tomato, half potato), it's pretty safe to assume that I like to eat AND drink! Due to my amazing mother and her culinary skills, I grew up not having to cook. Now that I am past the days of living with my parents and dining on NYC takeout, I'm on the path to trying and preparing new, exciting, healthy foods. Welcome to my journey! Sign up for FREE recipes by email! Copyright halftomatohalfpotato . Simple theme. Theme images by RedHelga. Powered by Blogger.